Murals wrap around the building, including this piece by brothers Jared and Ian Jethmal. A brand-new restaurant, bar, and community event and art space is coming to West Oakland. Called 7th West, the space will include a permanent kitchen for Filipino food purveyor Jeepney Guy, an outdoor beer garden, a small dog park, and Filipino-inspired cocktails. Located across from the Crucible, the POC-owned 7th West (1255 7th St.) is a whopping 8,500 square feet, with about half of it being an indoor warehouse space that’s part art gallery, bar, restaurant, and arcade. The space will open later this summer. The founders are all Oakland business owners: Pancho Kachingwe is a cofounder of The Hatch, Assan Jethmal is the founder of Good Mother Gallery, and Kevin Pelgone and Donna Brinkman are both from the Overlook Lounge. In addition, there will be a dog run outside. “We want to be so inclusive that even your pets will want to come and hang out,” Pelgone said. mouth-watering crispy lechon (pork belly), rice, lumpia, and kale salad, plus French fries, chicken wings, and some vegan options at 7th West. The bar will include some Filipino-inspired drinks on the menu. (Jethmal, Pelgone, and Brinkman are all of Filipino descent; Kachingwe is from Zimbabwe.) Down the line, they hope to also serve halo-halo, the Filipino shaved ice dessert made with ube ice cream, coconut, sweet beans, and more. The original, commissioned artwork that abounds inside the building and outside is colorful and represents the diversity of the artists and their styles. All of the current murals are by local Oakland artists, including Timothy B of the Lower Bottoms Crew, and the artwork is curated by Good Mother Gallery. There’s a particularly striking indoor painting of Bruce Lee. The plan is to rotate the art every several months or so. West Oakland was once a thriving arts district flush with African American blues and jazz venues, but many local Black-owned businesses were pushed out with the creation of the BART station, the post office, and the elevated freeway, as well as more recent redevelopment. 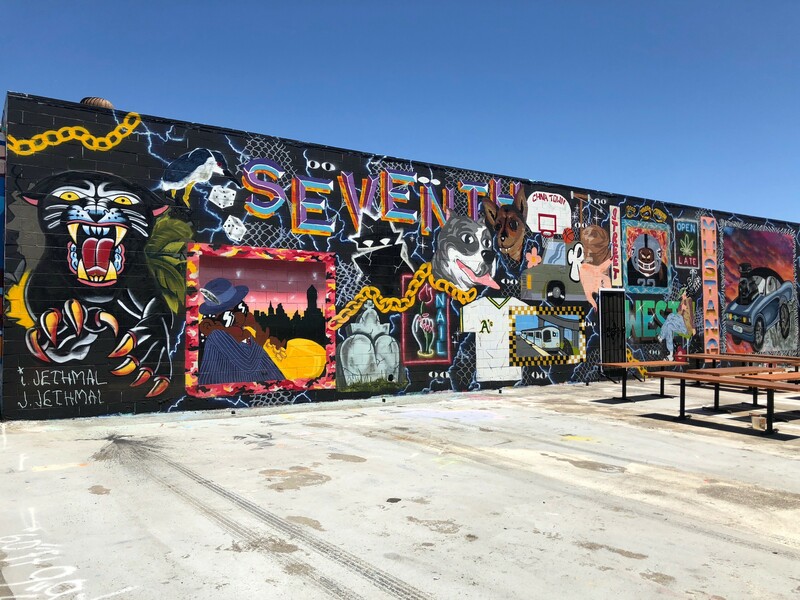 The founders of 7th West say they hope to beautify the neighborhood and pay homage to the history of 7th Street. “We really wanted to do something that revitalized the area, but we’re also cautious of what the area used to be, and not create a space that gentrifies the area, but supports the area,” Kachingwe said.